August 17, 2018 Amy P.
It's been a doozy of a week around here. I mean....non-stop hustle. I've had the kiddos home with me, which means I get asked 1.73k questions before noon. I've been putting the finishing touches on an upcoming adventure starting next week (more not that later), and I had a job interview and a new writing job. I'm dizzy just writing about it, and it's all done and done. I've also been managing (barely) keeping migraines at bay and spent a day at the science museum in Raleigh. It's no wonder I've been somewhat quiet online. In some ways, it's been a dreamy week of productivity, kid-time and being home, and in other ways it's just been a lot of tedium trying to get paperwork filled out, school supplies purchased and chore-charts laminated. I know. You laminate the chore-charts, too. 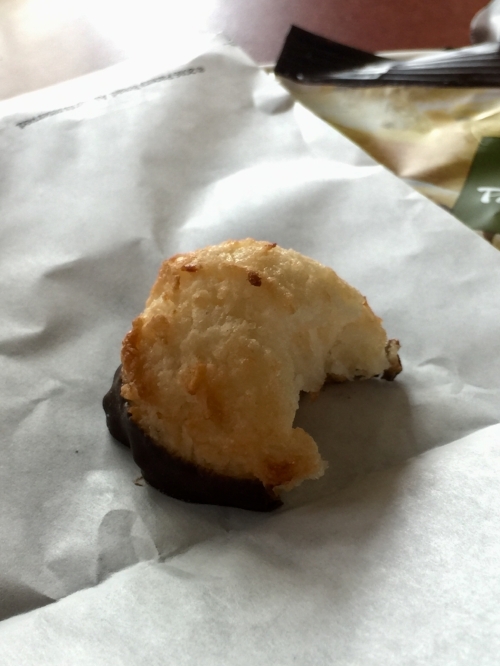 When you take the kids to Panera but can't eat the cookies because they're laden with gluten, you go ahead and get the macaroon and enjoy every single bite. I did. It was lovely. I started Monday morning off with coffee and M&Ms, sitting on the back porch in my pajamas, trying to convince Sandy M&Ms aren't worth it. She looked skeptical. I'm going to save you all a lot of time and $5 (for 3) and tell you these Bounce bites are awful. I am really tired of buying food and having it taste horrible. I miss Whole Foods, where you can ask to try something before you buy it. They're always so friendly about that. We cleaned out the garage on Sunday. We haven't gone through a lot of stuff for years due to constant moving. The movers will pack anything, and it's easy to just leave it all boxed up until the next move. I finally put my foot down and said, "No more taped boxes in the garage." So, an 8-hour garage unpacking ensued. My husband tried to put that lamp in the 'save' pile. I took that from the pile, assured him all of his paperclips and thumbtacks are still back in 1982, and put that lamp in the donate pile. One year ago today, I took this picture. I can't believe we've been here a year now. Time really does fly. I feel as though I'm must coming out of the post-move haze, which is typical for me. It takes a solid year before I can do much more than muddle through my days. I'm feeling hopeful for this next year and beyond and grateful we've settled in. Though I didn't get a pic before the recycling went out, I loved this Federalist Chardonnay. It's $20 a bottle (give or take), and I was so pleasantly surprised when I took my first sip. I really enjoyed this wine and paired with all sorts of salads this past week. I'm putting it on my go-to list. 8/10. I LOVE this Week of Outfits over at Cup of Jo. I want to be swathed in linen and rocking Abercrombie jeans in my 70s! This mom in the school drop-off line is...well....so me. I can relate, Mama. I can relate. Speaking of back-to-school, I read this article on what teachers really need/want. I won't be buying anymore Starbucks cards, or at least I'll also include a Staples card to go along with it! I really love this blogger's decorating style. She keeps it clean, minimal and fresh without being stark or boring. That's it. I'm looking forward to a weekend of laying low and hanging with the kids before school starts for our son next week and another year is upon us.